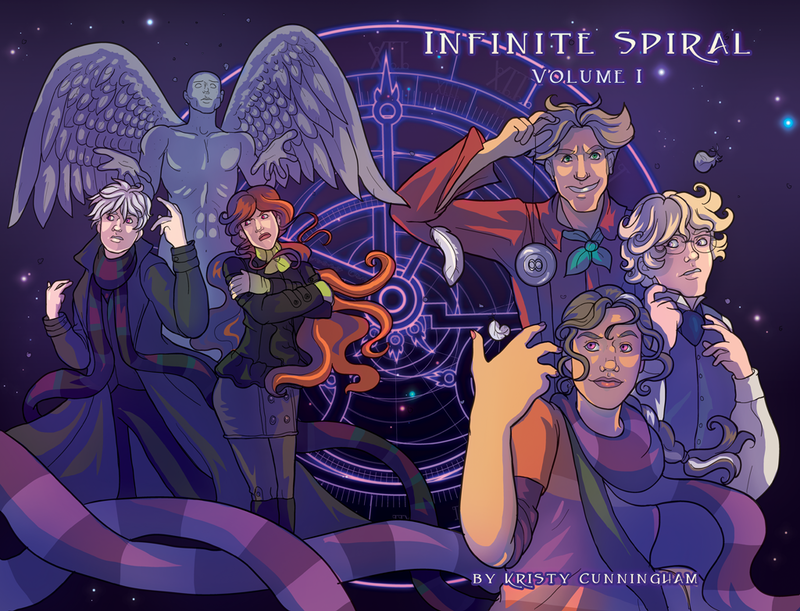 Infinite Spiral: Print Volume 1 is coming! Print Volume 1 is coming! The Prologue and Chapter 1 are finally coming to print. It has been a long process trying to reset pages to comic, instead of manga size, and create new cover art while still trying to keep up with weekly pages and other commitments. So instead of the latest page, here is the Volume I cover! I will be at Smudge Expo in Arlington, VA March 8, and am hoping to have copies of these on hand (so, health issues continued for my weasel and that didn't happen--*sighs*). However, I'm balancing work, my ferret's new health issues, this print run, and pages. The rest of chapter 2 is almost inked (4 pages to go! ), chapter 4 is over halfway drafted, and I'm pretty excited about the road ahead, so I hope you'll stick with me as I get everything sorted. I will be working to keep my schedule as best as possible, but I may have to drop to 3 pages per month to make everything happen! It was nice to meet everyone who dropped by my booth at Smudge. If you are new, welcome! Nice to see you here. I am working to get to the end of Chapter 2 by Friday (meaning it will wrap up for your in 3 weeks), and really talking to folks at Smudge had me realize what I need to do as I edit Chapter 3 and Chapter 4 to pick up the pace. So you know, pages may be at a brief stall, but I do post "scribbles" (post-day job scribbles I do to unwind) on my Tumblr, and they are all Infinite Spiral related and sometimes crossover fun! I welcome you to join me there too!